Click here for audio of Episode 2080. Today, we ask why only some inventions survive. The University of Houston's College of Engineering presents this series about the machines that make our civilization run, and the people whose ingenuity created them. 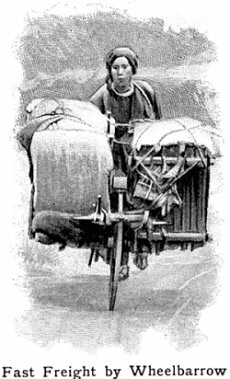 How often have you been surprised by some ancient version of a later machine -- Ibn Firnas's ninth-century glider flight in Cordoba, Spain, or Pi Sheng's eleventh-century use of printing with movable type in China? The more we look, the more we find. Why do such important things so often come and go, before they stay? Robert Temple offers clues about the nonsurvival of invention and science in his book, The Genius of China. The cessation of motion is due to the opposing force ... If there is no opposing force ... the motion will never stop. This is true as surely as an ox is not a horse. Here's a perfectly clear a statement of Newton's first law of motion, 2100 years before Newton's Principia. The Principia was part of a scientific revolution, while the statement in the Mo Ching is largely forgotten. And there's so much more: Horse collars, crossbows, iron plows, trebuchets, magnetic compasses, paper, stirrups, wheelbarrows, and not just gunpowder but firearms as well -- countless ideas that had a huge impact when they were either reinvented, or borrowed, by the West. Something that we need to understand is going on here. Temple points out that, when Jesuits turned up in China in the seventeenth century, the Chinese were fascinated by their European clocks. They forgot that they too had once made mechanical clocks. Temple calls that cultural amnesia. It took a British scholar, Joseph Needham, to unearth what the Chinese had once done. Start-ing during WW-II, he spent his life sifting old Chinese writings to find all the thinly-scattered mentions of science and technology. I think we might find an explanation might be found in the meaning of our word technology. It means the knowledge, or the lore, of technique. For 2500 years, the Chinese have had repeated periods of creative brilliance, yet they never fully celebrated all they'd done. Chinese invention didn't become technology in that literal sense of telling about, and dramatizing, their works. I've scratched my head over the way we canonize inventors who really only improved devices that already existed -- Edison, Bell, Watt. Maybe the Chinese were too sensible for such nonsense. But I begin to see the sense behind the foolishness. For us, Edison, Bell and Watt are more mnemonics than they are real people. They help us remember what we've done. Technology is sharing information about technique. The idea alone is necessary, but it's not sufficient. Invention isn't complete until we've shared it -- until we've told one another, maybe even boasted a bit, about our latest wonderful new thing. R. Temple, The Genius of China: 3000 Years of Science, Discovery and Invention. (Intr. by Jos. Needham) (New York: Simon & Schuster Inc., 1986). Images: Above from An American Engineer in China, 1900, and below from Through China with a Camera, 1898. Music in the audio from Fantasia on Cantonese Folk Themes, Hong Kong Philharmonic, Track 7, Denon 8242103. 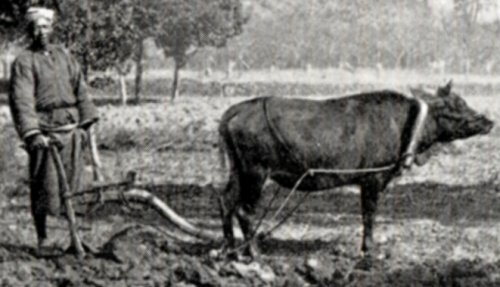 It may not look impressive, but the cutting edge of this furrow plow is iron. This equipment is much older in China than in the West.